Hey hey! Shopbop are having their biggest sale of the year right now! It’s only open to Loyalty Members today, but it’s super simple and free to join in, just sign up here with your email to get early access to the sale, birthday discounts, mystery discounts and more. SUNDRY Boy Tee – A grey graphic tee that doesn’t look so try hard. A.P.C. Half Moon Bag – I have this bag and I love it! Elizabeth Cole Linden Earrings – So drama. Alexander Wang Rina Slingback Heels – Yikes. I need these. Edition10 Satin Skirt – Lovely burgundy colour. I’m totally lusting after this skirt! 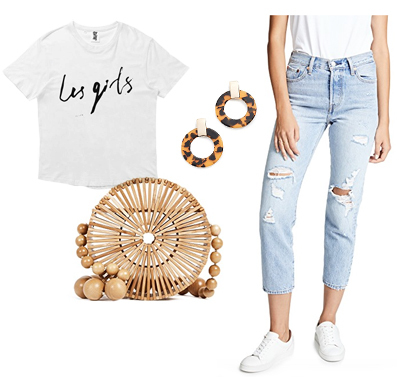 Les Girls, Les Boys T-Shirt – I have this tee and I wear it all. The. Time. Cult Gaia Bamboo Circle Bag – The coolest bag ever. I use it as a clutch though. BaubleBar Torrie Resin Hoop Earrings – On trend. But not over the top. Levi’s Wedgie Straight Jeans – These look sooo good! Happy shopping and I hope you find find something you like!